our aim was to produce a “Guide” for young people and practitioners to benefit from. with racism more effectively and to counteract the negative effects of racism. The project entailed conducting discussion groups and interviews with pupils and staff from 6 schools in Sandwell, the findings from which fed into a questionnaire, which a total of 9 schools participated in completing. 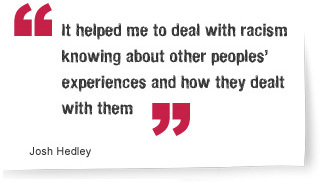 This research means that this toolkit is directly informed by young people from Sandwell. What did the young people in Sandwell tell us? Just under half of pupils in Sandwell have experienced racism. The most common form experienced is racist name-calling. The most common response to any form of racism was to talk to friends. Many different forms of racism were referred to (subtle and extreme). Racism was reportedly found at school, in the community, at home, in the media, among friends. Racism has become an everyday occurrence. It often gets overlooked and is not always recognised. Though most schools deal well with racism, pupils sometimes feel schools could do more and that little is offered to prevent racism or support young people after a racist experience outside of school. We’d like to thank the teaching staff and schools that have accommodated and assisted us throughout the project. Without their help we would not have been able to conduct this important research. We’d also like to thank the Sandwell Youth Cabinet team and our Steering Group, whose advice and input has allowed us to get well-rounded opinions from a number of professional bodies who are concerned with improving the lives of young people in Sandwell. Most importantly we’d like to thank the 160 pupils we interviewed in the first phase of the project and the 1210 pupils who filled out our questionnaire in the second phase. The pupils were taken from Years 8 and 10, across ten secondary schools in the West Midlands borough of Sandwell. We also thank those who continue to be involved in the project.